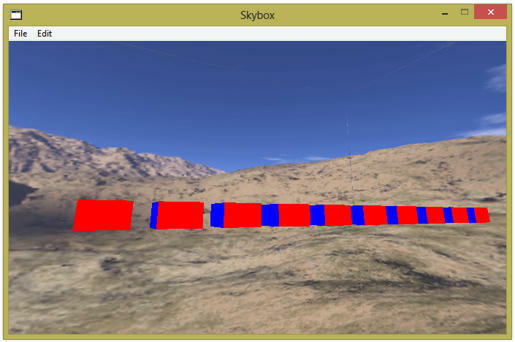 Does anyone have a simple skybox or environment box example for OpenGL without windows handlers? I have been trying to make one for the last couple of weeks without any success. Chuckle, I have been through many C++ and other programming language examples with OpenGL, and I am unable to port any of them to Real Studio. 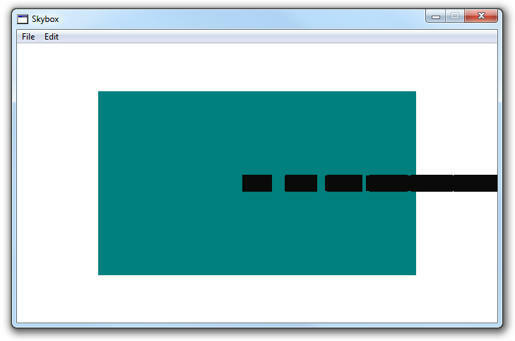 Here is an example where there are 10 smaller boxes drawn, and one larger box (skycube). Press the w, s, a, and d keys to move around. Hold the left mouse button to change the camera angle. It looks like I can't seem to get the textures working. The textures for the skycube are oback6.raw, ofront6.raw, etc. Has anyone else had success? Last edited by eugenedakin on Sat Nov 03, 2012 6:37 pm, edited 1 time in total. Got your code running and no textures either, but it does look OK to me: generate texture bank, store image data, bind to bank, draw with TexCoord. Not familiar with the use of .raw pictures and how you passed them into glTexImage2D; guess it works though because there's no complaining. Here's a relatively minimal example that works for me. You may need to change the "OpenGL.framework" lib used. Once you have textures working a skybox is keeping the cube centered about the camera (can't tell if your example does this). //*and picture dragged into project and renamed "myPic"
I will give it a go this weekend! 1. leave lighting disabled, that's why the cubes are black. For lighting you need to setup a light and set colors with glMaterial. 3. add window property 'TextureID As integer' and remove the the dim line for it in InitTexture. This value needs to be saved. 4. in drawSkybox pass TextureID into glBindTexture instead of the constant Sky_Top. Comment out the other glBindTextures because only one texture is loaded. For 6 images generate and save 6 TextureIDs. 5. disable cullface before drawing the skybox and move the enabling lines to afterwards. When inside a skybox no faces get culled. To finish off the skybox you'll need to translate to the cameras actual eye position, which is happily available. This is the Render code I ended up with. glColor(1,1,1) is there because GL_MODULATE tints the texture by this color (use GL_REPLACE for no tinting). Also, no need to begin and end each quad, just keep listing 4 points. I have implemented all except the textures (working on that one right now). The code was great, and thank you for sharing!!! !